Local Profile: Stone Parker — Field & Compass, Ltd. The Japanese tradition of mokume-gane starts with more than 20 layers of metal— gold, silver, copper or platinum—all fused together, and then twisted, hammered, ground, and rolled flat. The outcome is the look of wood grain, crashing waves, or clouds in a sunset. That’s the background in most of the jewelry Stone Parker makes from his wind- and solar-powered studio outside of Leavenworth. He’s one of a handful of Northwest artists who specialize in the technique. In the foreground of Stone’s work, the story of people’s lives are layered, soldered and polished to wrap comfortably around the finger. Like a tattoo artist, Stone deals in symbols. Around here, that meaning often takes the form of mountains. He once made a pair of wedding rings for a Hood River couple who met on a backpacking trip to Mount Taranaki in New Zealand. Their rings were the ridgeline of Mount Taranaki, and on the other side, Mount Hood with the calming waters of the Columbia. His canvas is only about 60-by-8 millimeters. “It’s all about layout,” he quips. “A simple doodle will make the best ring. Sometimes it’s just a sketch—something you’d put on the back of a napkin.” Like a tattoo, the art is personal and meaningful. The materials are permanent and expensive. The pressure to get it right—in time for the wedding—is still nerve-racking, even after 24 years, he said. The class required students to make three projects; Stone made ten. That’s where he made his first mokumé wedding ring. It was a river motif for a man who did field work for trout habitat. “Someone came to me and said, ‘Wow, you could make a living off of that,’ and something went bing!” Before that moment, Stone had never considered becoming a wedding ring jeweler. After college, he moved to Crested Butte, Colorado, to snowboard and establish his business. “It was every last bit of the word community,” he remembers. But, he needed more snow. 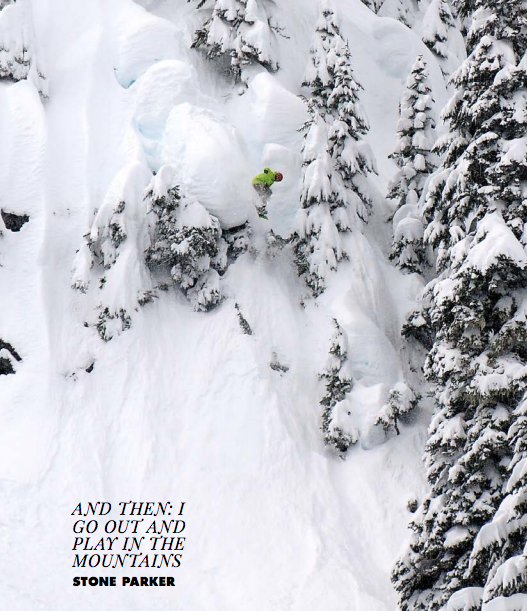 He found Stevens Pass by accident on a road trip in search of powder. That season, it snowed a foot or two every night for a month, so he decided to build his home there 16 years ago. 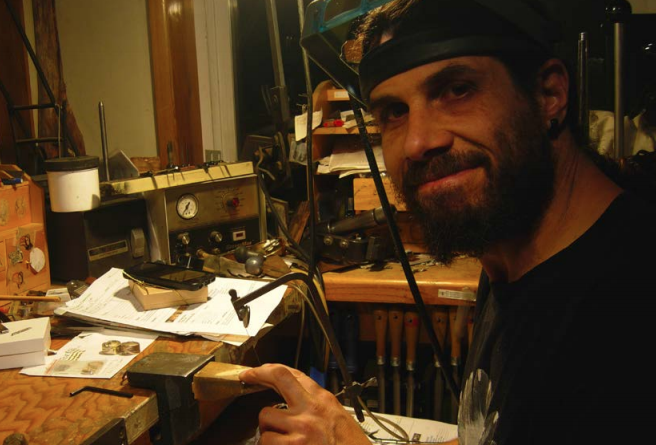 He shows his work in downtown Leavenworth with eight other artists at Benchmark Jewelers.